In the spring and summer of 2010, if you were to Google “Bryce Cotton basketball”, this (above photo) is the type of recruiting profile you would have found (minus the commitment). No player news, no photo, and the daunting NR (no rating) for his scout grade. The 6 foot guard from Tucson, Arizona wasn’t highly touted enough to receive a grade. At this point, it seemed going D1 was a far fetched option. But then a minor stir was started by an avid Louisville Cardinals fan by the name of Austin Montgomery. On July 21, 2010, Montgomery posted his thoughts on Bryce Cotton on the Louisville basketball forum “Card Chronicle”. “Bryce Cotton Wouldn’t Mind Louisville” was simply a post from a high school fan, advocating why Cotton should have been receiving more attention than he was. Louisville Cardinal skeptics came flooding out of the woodwork poking fun at the lack of info behind this guard from Palo Verde High School. But with Cotton already graduated, and still lacking any national hype, it was difficult for anyone to look much further. Two days later another post appeared on the same website. “Bryce Cotton For Louisville” came as a response to the buzz regarding the previous post. Cardinal fans knew nothing about Cotton but were dying to efficiently learn everything. A simple skim of the article would allow Louisville fans to find out that the 6 foot guard seemed to be pretty overlooked. Cotton had a great high school resumé resulting in zero D1 offers. Junior Colleges and fighting for one of Houston Baptist University’s two available scholarships is what Bryce Cotton’s summer had come to. But for the Louisville faithful, they had begun to hope Cotton would turn into Rick Pitino’s super-secret late summer steal. On August 18, 2010, all of this came to screeching halt when Cotton reportedly committed to Miami-Dade College. Somehow still lacking D1 offers, this was his “best-case scenario”, according to Palo Verde Coach Chris Klassen. The brief but eventful online Bryce Cotton frenzy had come to a disappointing end. He would be a Miami-Dade College Shark and not a Louisville Cardinal as many had hoped. 12 days later, it was announced Bryce Cotton had committed to somewhere other than Miami-Dade. No, not Louisville, but their in-conference foe, the Providence Friars. Friar fans began to rejoice across recruiting blogs as they slowly started to realize the minor obsession Louisville fanatics had over Cotton during the past summer months. While the stir over Cotton and Louisville was quickly gaining momentum through college basketball blogs, Friars Head Coach Keno Davis was quietly putting in the work to get the guard to Providence. The Bryce Cotton era in Friartown began on October 15, 2010, when the new kid on the block from Arizona won the slam dunk contest at the Friars’ Late Night Madness (watch highlights above). Barely 6 feet, Cotton came into Alumni Gymnasium throwing down dunks that sent chills down the spine of every Louisville Cardinal fan who had ever googled him. If I’m a Cards fan in 2010 and watching the above video, I would have thrown up all over my keyboard. During his freshman year, Cotton averaged just over 15 minutes a game and scored in double figures four times over the course of the season. Not a bad start at all. Sophomore year comes around and Cotton averages 38 minutes and 14 points a game, with the signature event taking place on January 10th at the Dunkin’ Donuts Center in Providence. Facing the 14th ranked Louisville Cardinals, the unranked Friars dominated Rick Pitino’s team from start to finish. Bryce Cotton finished with 27 points, going 5 for 5 from three, as Providence squashed the nationally ranked Cards 90-59. Feeling like a swift kick in the gut, Louisville fans found themselves playing the always sour “what could’ve been” card. Following an outstanding junior year where he put up 19.7 points per game, Cotton’s senior year was extraordinary to say the least. Averaging 21.8 points a game, Cotton had to make up for the injuries of backcourt partner Kris Dunn. In doing so he played 40.1 minutes a night; mind you there are only 40 minutes in a college basketball game. He was the first player in the country to average over 40 minutes a game since Chris Quinn of Notre Dame did so in 2005-06. Cotton led the Friars to their first Big East Tournament title since 1994 while taking home the tournament’s MVP honors. Providence would be matched up against the 6th seeded North Carolina Tar Heels in the first round where Cotton would get to put on a show on the national stage. And to say he put on a show would be a complete understatement. Making one dazzling shot after another, Cotton scored 37 points as the Friars played their first NCAA tournament game since 2004. Unfortunately Providence couldn’t deal with a late UNC comeback, as they would eventually lose 79-77. Going 13 for 23 from the floor and adding 8 assists, Cotton left everything on the floor at the AT&T Center in San Antonio. On June 26, 2014, the NBA Draft came and went, and Bryce Cotton found himself right back where he was after his senior year of high school; underrated and overlooked. Going undrafted, he signed with the San Antonio Spurs on July 7th and immediately joined their summer league team. Cotton was waived by San Antonio on October 23rd and eventually landed on the D-League’s Austin Spurs where he would once again be forced to prove himself. In 34 games at the D-League level, Cotton put up stellar numbers at 22.4 points per game. However a three week rampage from January 30th to February 18th made it almost impossible for him to not receive an NBA call-up. Averaging 29.7 points per game and shooting an unbelievable 50% from the field, Cotton led the Austin Spurs to a six game win streak which quickly gained the attention of NBA scouts. Keep in mind this all came after his 40 point performance on January 17th. Something’s gotta give, right? Rightfully so, this got the ball rolling as Cotton signed a 10-day contract with the Utah Jazz on February 25th, followed by another 10-day deal on March 6th. Clearly the Jazz were liking what they were seeing in him, as they finalized a multi-year contract with Cotton on March 16th. Nobody deserves it more than the persistent Tucson native. His grit is never-ending and his talent is eye-opening. I have no doubt we’ll be hearing much more from Bryce Cotton as his NBA career moves on. Ask any Louisville Cardinals fan, I bet they’ll tell you the same thing. P.S. Below is Bryce’s first career NBA three versus the Denver Nuggets. Here’s to many more. March Madness started out with a bang Thursday including eleven games finishing with final deficits of single digits and two 3 seeds immediately getting sent home. The round of 32 is concluding as I type this very sentence and is still giving us a reason to watch truTV (If someone can find me an answer as to why games are still broadcasted on that channel that would be greatly appreciated). But come tomorrow morning, everyone will be looking forward to the Sweet 16. There will be plenty of weekend recaps to help you catch up on everything you missed in the first four days of the tourney, but here are some things to keep in mind going forward. Duke is good. Like, really good. Everyone always just assumes Duke will make a run in the tournament because, well, they’re Duke and that’s what they do. This assumption is once again correct come 2015, but this team is different. I normally think of Duke as the San Antonio Spurs of college basketball. They’re good no matter what, kind of boring to watch, and not very appealing to the naked eye. This team just seems a little different. Don’t get me wrong, I hate Duke. Can’t stand them. But these guys can play. Freshmen Jahlil Okafor and Tyus Jones are a ton of fun to watch while Quinn Cook brings along the veteran role at shooting guard. 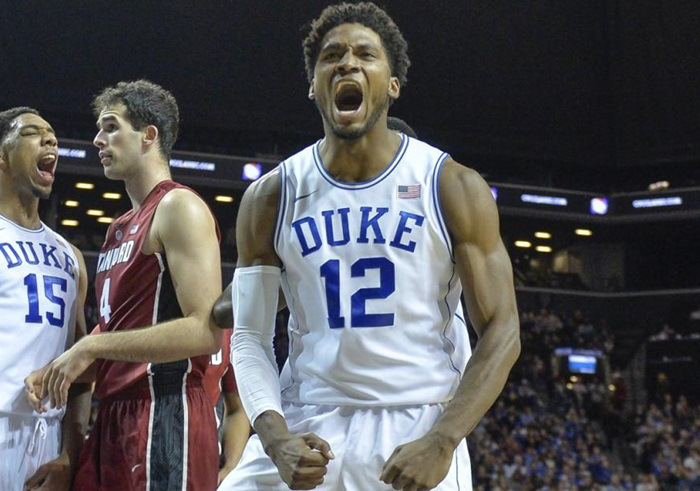 Justice Winslow is the energizer bunny for Coach K and is one of the best defenders in the entire country. And he’s only 18. Winning their first two games by a combined 48 points, this team is primed for a deep run. 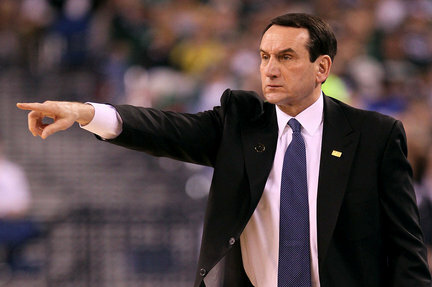 As much as it pains me to say, beware of Coach K and the boys. Gonzaga is always the team that comes into the tournament with only three losses, but a weak regular season schedule. Being the victim of many premature upsets, the Zags seem deeper to me than they have been in the past. If this does turn out to be true, they could be quite the threat. Led by Kyle Wiltjer and millionth-year senior Kevin Pangos, Gonzaga is looking to build off of their WCC Championship and break their trend of disappointing tourney runs. 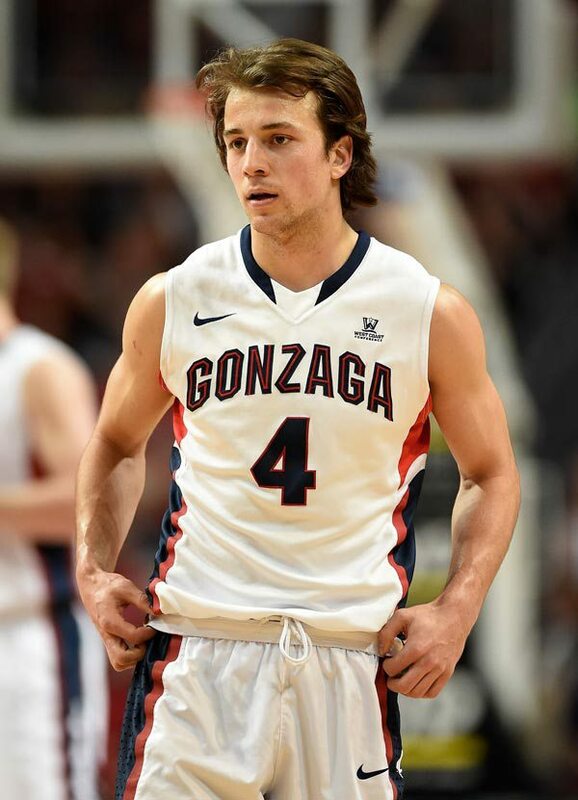 Running into Duke in a potential elite eight matchup could create some problems for the Zags, but with Kevin Pangos’ hair, anything is possible. I feel like I’ve been watching this kid play at Gonzaga since I was in kindergarten, but they swear he’s a true senior. Whether you buy that claim or not, his hair has gone through some pretty incredible transformations over the years (which needs its own article in itself) and has definitely hit its peak here in 2015 as he’s pulling off the Marty McFly look to perfection. Plus they have two players named Przemek and Domantas. What’s not to love? 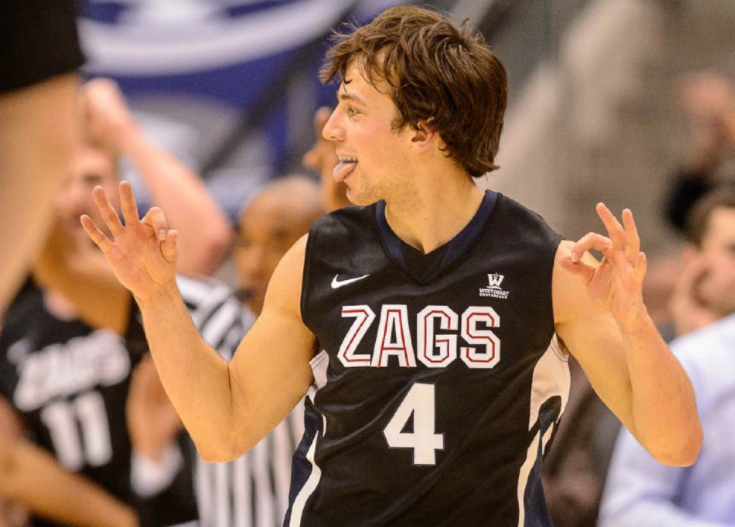 Long live Kevin Pangos and the Zags’ tourney run. Find me better hair in college basketball. You can’t. Ranked 18th in the country coming into the season, the Spartans season got off to a rough start. Quickly falling out of the top 25, Tom Izzo’s team struggled to find a consistent formula for success. Since the beginning of March, the Spartans seem like a different team. If anyone can get a team to peak at the right time, its Izzo. Coming in at a very dangerous 7 seed, the green and white beat Georgia and then upset 2 seed Virginia to push through to the sweet 16. Look out for the Spartans as it seems that elusive winning formula has finally found a home in their locker room. Don’t pick against Tom Izzo in March. 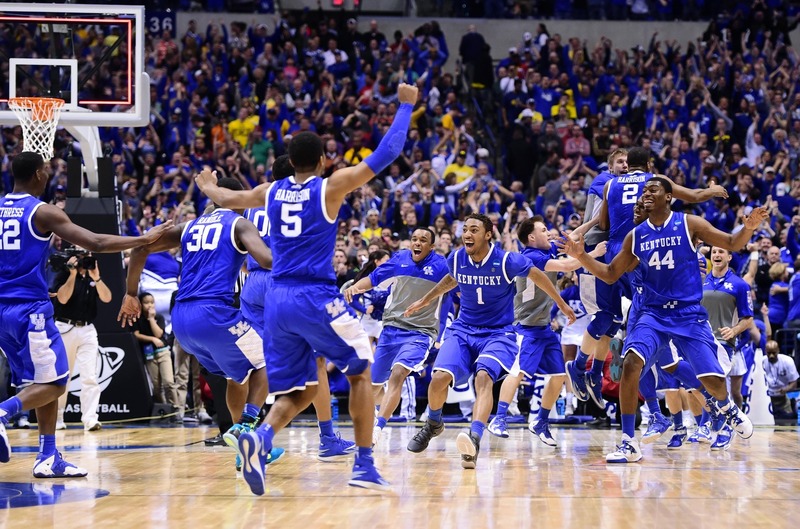 Next up for the Mountaineers is the almighty Kentucky Wildcats. They live and die by their smothering defense. As unbeatable as Kentucky seems, don’t assume West Virginia will be an easy W for the tournament favorites. The Wildcats haven’t faced a defense like this all year. I’m not saying WVU will pull off the upset, but I really think the Mountaineers will give Kentucky a run for their money. I could touch upon every aspect of the tourney going into the sweet 16, but that would turn into a novel. Not many people realize this, but Andy Williams’ famous Christmas tune, “It’s the Most Wonderful Time of the Year”, was actually written about these three weeks of college basketball chaos. Soak it in, it doesn’t get much better than this. Bias Post #1: Third Time’s the Charm? With writing comes bias and with March Madness comes the Big East Tournament. 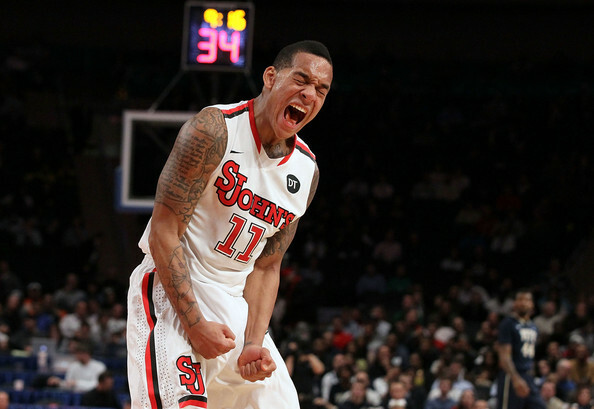 Thursday at 2:30 my Providence Friars will take on the St. John’s Red Storm for the third time this season. Both teams sit at 21-10 on the season and are in good position to make the NCAA Tournament come selection Sunday. If there’s one team the Friars were looking to avoid in tournament play, it was the Red Storm. Serving as Providence’s Achilles heal this season, St. John’s went 2-0 against the Friars this year, winning 83-70 in Rhode Island on January 14th, and then 75-66 at Madison Square Garden three weeks later. Let’s take a look at where each team stands entering crunch time here in March. Coming off a loss to the #21 Butler Bulldogs and losing their #24 national ranking, PC looks to get back on track on center stage at MSG. A major key for this Friars squad is getting off to a quick start. As of late, they’ve found themselves climbing back into games come the second half because of slow starts. This past week, the Friars had to put on a second half clinic led by Kris Dunn and LaDontae Henton to come back and beat Seton Hall. Outscoring the Pirates 50-29 in the second allowed them to secure the victory but things weren’t so easy against a battle tested Butler team. Seeing second half deficits as large 16 points, the Friars fought back to cut the lead down to just 1 but couldn’t finish the job. If Providence wants to get that elusive win against the Red Storm, they have to come out guns blazing with a ton of energy. Relying on a second half push won’t do the job in the Big East Tournament especially against a St. John’s team already playing on their home court. 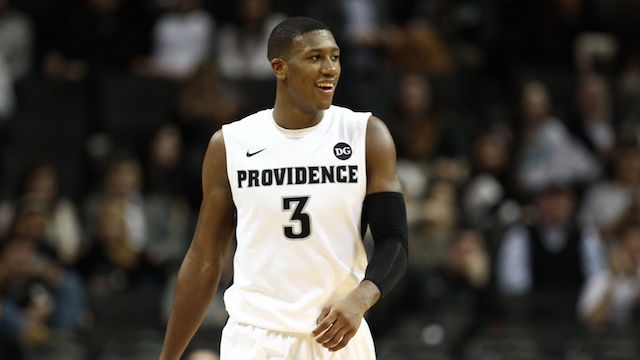 Kris Dunn needs to continue to play big. He’s been Mr. Reliable as of late for the Friars and they need him to take control of this game from the get-go. LaDontae Henton is the team’s leading scorer and against St. John’s on Thursday, he needs to do just that; score. Coming off just 8 points against Butler, he’ll have to get back to his normal form and provide that scoring punch that Ed Cooley and his Friars need. PC is going to need a solid performance from role players like Tyler Harris, Carson Desrosiers, and freshmen Ben Bentil. If those guys can play big on the glass and tough down low, they’ll put the Friars in a nice position to win. Led by the scariest man in all of college basketball (D’Angelo Harrison, pictured above), the Red Storm come into the Big East Tournament following a loss to the all-powerful Villanova Wildcats. Before that loss however, St. John’s had rattled off four straight wins in convincing fashion. Being completely healthy for the first time since the beginning of the season, the Red Storm represent a dangerous dark horse for the rest of the Big East. Beating a team three times in one season is a tough thing to do however. Staying out of foul trouble is of extreme importance for Steve Lavin and his squad. The Red Storm play a solid six players and that’s about it. Depth is not their strong suit. If this team gets hot and goes on a run though look out; they’re tough to slow down. You can count on Harrison to get his share of points, but the Red Storm will look at Rysheed Jordan, Sir’Dominic Pointer, and Phil Greene to contribute in a consistent way Thursday. If St. John’s can get all around production from their lineup, they’ll be a difficult team for anyone to beat. For outsiders, this is a great matchup early on in the Big East Tournament. For St. John’s and Friar fans alike however, this is one that’ll give you stomach cramps. Beating a team three times in one season is quite the difficult feat, while on the other hand the Red Storm seem to be unbeatable from a Friar’s standpoint. Look for PC to try to get St. John’s into early foul trouble and make them test their questionable depth. St. John’s will try come out firing and looking to run against this all to familiar Providence lineup. This will be a great test for both teams entering tournament play. If you tune in to watch this game you won’t be disappointed.